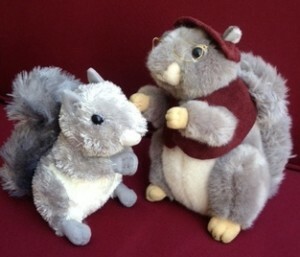 Grandpa Grey is a squirrel who specializes in spinning new fairy tales and fables. He’s the creation of author John William Wisor and illustrator Nila Brereton Hagood, and he’s also the thread weaving together their first book, Grandpa Grey’s Timeless Tales and Fabulous Fables. Among this first collection are stories about dragons, fairies, mermaids, and how God came to create pets. The Grandpa Grey web site has information about the book, illustrations from it, and a preview video for it. Grandpa Grey is represented by a custom-designed plushy toy, which is unfortunately not for sale. But the plushy toy of his eager young story listener, Baby Grey, is for sale.